The Terminator Governator shares some truly profound insight as to why California's non-partisan Legislative Analyst's Office is wrong in their conclusion that the state's greenhouse gas emissions bill will destroy jobs. "I travel up and down the state, unlike others that only have theoretical opinions," the governor said. "I see firsthand … that all kinds of (green industry) places want to expand, all we have to do is give them the incentives, the tax incentives and the job creation packages. I know that AB 32 will create jobs." You mean, unprofitable companies are happy to be handed billion of dollars in taxpayer subsides? Crazy! California's AB32 legislation highlights what I would consider to be the biggest fraud in the history of "renewable" energy. Part of that legislation was the Renewable Portfolio Standard (RPS), which outlines the target percent of the state's energy portfolio that must come from "renewables." 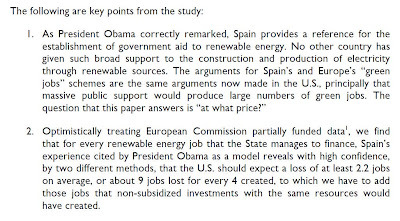 Among acceptable renewable energy sources are wind, solar, geothermal, biomass and small hydro. Notice that last one was small hydro. That's because large hydro is excluded. Instead of celebrating California's leadership in low-emission hydroelectric energy procurement, AB 32 excludes large hydro from the definition of "renewable energy." For those wondering, yes this would be the same as including a 1 acre solar panel farm and excluding a 10 acre one. Why would our well-intentioned green lobby exclude large hydro, that is every bit as renewable as a small hydro project? 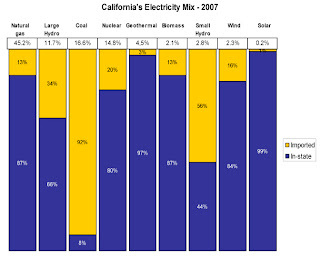 Because if it were included, California would have already hit its 20% 2010 renewable target back in 2007. More recently, California upped the RPS percentage target to 33% by 2020. You can contact the California Public Utility C omission directly to ask for an explanation for this fraud, and you almost feel bad for the people replying. They're rightly embarrassed to say that large hydro is excluded for no other reason than we'd already have hit the targets. Large hydro does not qualify for the RPS and is thus excluded. If large hydro were included, the renewable portion of electricity in the State would be higher. Unfortunately, the Energy Commission does not have any information on the original decision to exclude large-hydro projects from theRPS program. Hydro-projects were excluded from the program by law, so we have no reason to evaluate them any further. To the best of my knowledge they were excluded do to concerns about their environmental impacts, I believe environmentalists were involved in the decision process before the law excluding them were finalized, but I do not have detailed reasons for their exclusion. 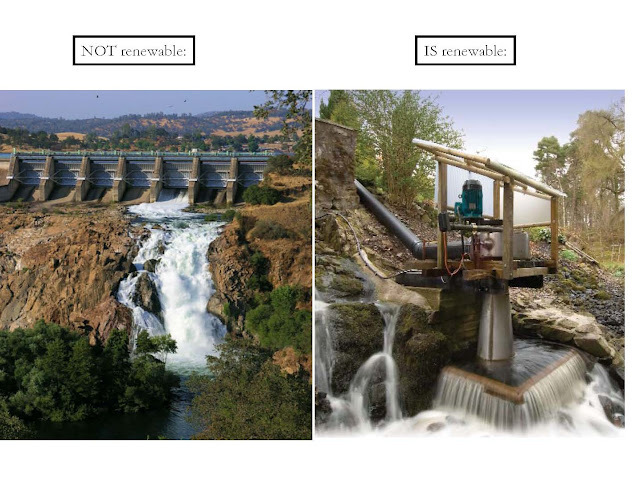 Just so we're clear, here's what California considers renewable hydroelectric energy, and what it excludes.